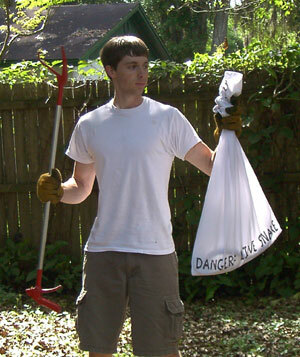 Here's a snake in a snake sack, caught by AAAnimal Control of Orlando Florida. Wondering how to get rid of snakes? The best way is to hire a professional to come and remove the snake(s) for you. The best way to prevent snakes is a habitat modification. Loose debris should be removed, gaps and cracks leading to cool, dark, denning areas should be sealed shut, and vegetation should be trimmed. As an extreme solution, a fence installed around the perimeter of the property and sloping outward at 30 degrees will keep them out permanently. There are some snake repellants available, but none are foolproof, and most of them in my experience just plain don't work. Some home remedies include the use of sisal rope to prevent them from crawling onto the property, but it doesn't work. Ultrasonic sound emitters don't work either (snakes can't hear). Fake owl decoys are worthless, as is predator urine, such as coyote urine. Mothballs don't work as a deterrent, and neither does sulfur. Snakes can be trapped. Snake traps are usually of two types: giant glue board traps, and funnel type traps. You'll probably want to call a pro to provide and set these. 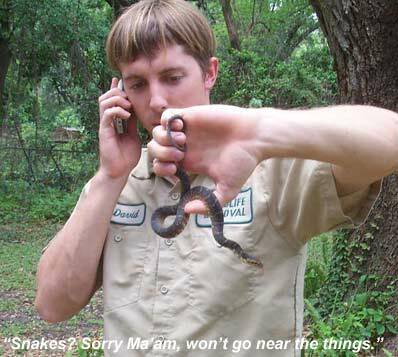 Ultimately, the best way to get rid of snakes is to call a pro who knows exactly what they are doing: what species of snakes they are dealing with, and how to best handle the situation. Remember, if you are ever unsure of the species of snake you see, it's safest to just leave it alone. If you do want to trap your own snakes, you can certainly do so. You can click here to order a snake trap to do it yourself. For more info, go back to the snake removal page. What to do with a snake in the house - You already know the answer to your question: you need to remove and relocate the snake. You?re probably wondering how to catch the snake. If you need it out of the house immediately, assuming it?s in an area that is occupied often, you will have to make sure that it is not venomous first, then man-up and grab the snake and put it in a pillowcase, which is an excellent snake sack. This is not difficult. All you need are some thick gloves and nerves of steel. Try to firmly but gently grasp the snake behind the head and near the tail. Equal pressure is a good method of holding a snake. If you grab the animal without a plan, the front end may whip around and sink its teeth into you. Even though you?re only going to handle a nonvenomous snake, a bite will still hurt and will bleed profusely. All you need to do is get the snake into a pillowcase. Once it is inside the cloth you will be able to transport it to a safe area for relocation. Venomous snakes inside the home should never been dealt with by the homeowner. Most venomous snake bites occur because someone was trying to kill the snake or pick it up. A scare snake will bite, and a viper can strike out and grab hold before you know what hit you. I advise you to call out a professional such as myself if you cannot properly identify a snake inside a house.